This was our last State to clean up before the big number 50. An oversight regarding the existence of different time zones and their boundaries made for a tense 7 hour drive out there. On the return journey our desire to get back home in time for dinner saw us miss the award ceremony and Leah’s trophy. However I did discover air-conditioned seating and now my life, and car experiences, will never be the same. Full write-up. 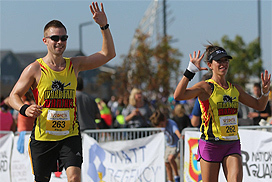 Posted in Marathon Race Reports and tagged 2015, kansas, KS, leahwins, marathon, Prairie Fire, running, Wichita.